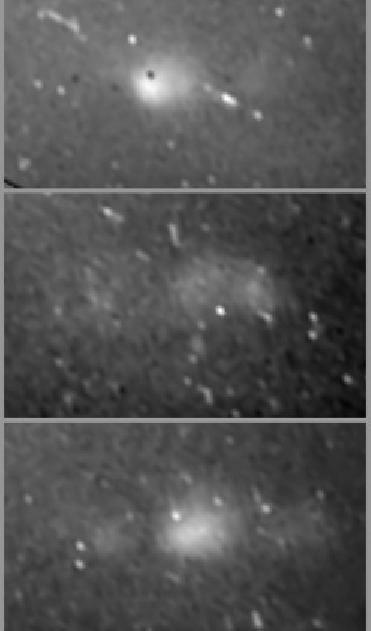 NEW DELHI (BNS): Complex interactions between Saturn and its satellites have led scientists using NASA's Cassini spacecraft to a comprehensive model that could explain how oxygen may end up on the surface of Saturn's icy moon Titan. The presence of these oxygen atoms could potentially provide the basis for pre-biological chemistry, NASA said. The interactions are captured in two papers, one led by John Cooper and another led by Edward Sittler, published in the journal Planetary and Space Science in late 2009. Cooper and Sittler are Cassini plasma spectrometer team scientists at NASA's Goddard Space Flight Center in Greenbelt, Md. In one paper, Cooper and colleagues provide an explanation for forces that could generate the Enceladus geysers that spew water vapor into space. In the other, published in the same issue, Sittler and colleagues describe a unique new process in which oxygen that circulates in the upper atmosphere of Titan can be carried all the way to the surface without further chemical contamination by being encased in carbon cages called fullerenes. The work draws upon previous work by Sittler and others that model the dynamics of how particles, including water molecules, travel from Enceladus to Titan. At Enceladus the flow process begins with what they call the "Old Faithful" model. In this model, gas pressure slowly builds up inside Enceladus, and then gets released occasionally in geyser-like eruptions. Unlike terrestrial geysers, or even geyser-like forces on Jupiter's moon Io, the model proposed by Cooper shows that charged particle radiation raining down from Saturn�s magnetosphere can create the forces from below the surface that are required to eject gaseous jets. Energetic particles raining down from Saturn's magnetosphere � at Enceladus, mostly electrons from Saturn's radiation belts -- can break up molecules within the surface. This process is called radiolysis. Like a process called photolysis, in which sunlight can break apart molecules in the atmosphere, energetic radiation from charged particles that hit an icy surface, like that of Enceladus, can cause damage to molecules within the ice. These damaged molecules can get buried deeper and deeper under the surface by the perpetual churning forces that can repave the icy surface. Meteorites constantly crashing into the surface and splashing out material might also be burying the molecules. What's unique about the "Old Faithful" model is that it "is a model for cryovolcanism that is based on not only liquid water, but also requires the production of gases by the radiolytic chemistry observed at Enceladus," said Sittler. The plumes that emanate from Enceladus' south polar region consist of water, ammonia and other compounds. 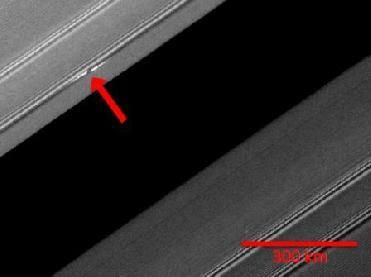 Scientists have known since the 1980s that Saturn's magnetosphere is inexplicably filled with neutral particles. Sittler's new model indicates that as these broken water molecules enter Titan's atmosphere, they may be captured by fullerenes�hollow, soccer-ball shaped shells made of carbon atoms. Although the heavy molecules Cassini has detected in the upper atmosphere of Titan may be other molecules, Sittler suggests they are likely fullerenes. In Sittler's model, the fullerenes then condense into larger clusters that can attach to polycyclic aromatic hydrocarbons�chemical compounds also found on Earth in oil, coal and tar deposits, and as the byproducts of burning fossil fuels. The fullerene clusters form even larger aerosols that travel down to Titan's surface. This process protects the trapped oxygen from Titan's atmosphere, which is saturated with hydrogen atoms and compounds that are capable of breaking down other molecules. 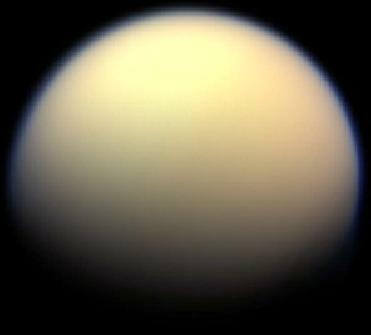 Otherwise, the oxygen would combine with methane in Titan's atmosphere and form carbon monoxide or carbon dioxide. Until now, scientists have not been able to explain how oxygen fits into the picture of the dynamics and chemistry of Saturn and its moons. As the oxygen-rich aerosols fall to Titan's surface, they are further bombarded by products of galactic cosmic ray interactions with Titan's atmosphere. Cosmic rays bombarding the oxygen-stuffed fullerenes could produce more complex organic materials, such as amino acids, in the carbon-rich and oxygen-loaded fullerenes. Amino acids are considered important for pre-biological chemistry. Scientists have been able to couple the new models that describe the generation of plumes at Enceladus and oxygen ion capture in fullerenes near the top of Titan's atmosphere to existing theories of the transport of oxygen across the magnetosphere. 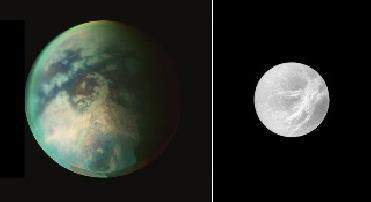 Taken together, Sittler and Cooper suggest a chemical pathway that allows the oxygen to be introduced to Titan's surface chemistry, NASA said. 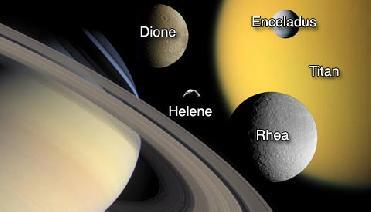 The Titan flyby, on Monday, will take Cassini to within about 7,500 kilometers (4,700 miles) of the moon's surface.